Super Nintendo Console SNS-101. Power adapter can be used for SNES or NES consoles. 100% Authentic USA Version Nintendo SNES Classic Edition Mini Console. Super Mario World™. Super Mario Kart™. Super Punch-Out! Super Castlevania IV™. Kirby™ Super Star. Super Mario RPG: Legend of the Seven Stars™. 5 out of 5 stars - Authentic REAL Super Nintendo Entertainment System SNES Classic Mini NEW !! 1,809 product ratings1,809 product ratings - Authentic REAL Super Nintendo Entertainment System SNES Classic Mini NEW !! Trending at $110.00eBay determines this price through a machine learned model of the product's sale prices within the last 90 days. Step back into the 90s to relive timeless gaming experiences with the Nintendo Classic Mini: Super Nintendo Entertainment System that was released in Europe. 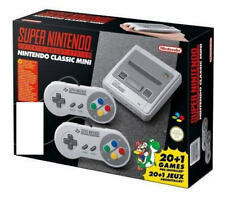 The Nintendo Classic Mini: Super Nintendo Entertainment System contains 21 classic games and can be easily connected to an HDTV using the included HDMI cable and will be available only for a limited time. BRAND NEW, BOUGHT FROM WAL-MART THIS MORNING 9/30/17. Will arrive to you brand new factory sealed. Just plug it in and play! Retro gaming perfection. Live out the golden age of 16-bit gaming like never before. Don’t miss out on your chance to unlock and play Star Fox 2,the never-before-released sequel to Star Fox. 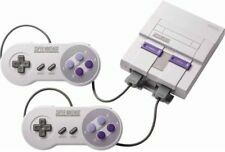 Super Nintendo Entertainment System 2017 SNES Classic Mini Auction is for the latest Nintendo console...the SNES Classic Mini. This is brand new n the box and ready to ship. Make sure you get it for Christmas now. NEW SNES CLASSIC. Mini Console. 1 HIGH SPEED HDMI CABLE. 1 USB CABLE. Brand new mint in box. And in hand, ready to ship. Console is brand NEW, in box, unopened!! FREE SHIPPING! US BUYERS ONLY! SUPER POWER. Kirby Super Star. Super Castlevania IV. Super Mario World. Super Ghouls 'n Ghosts. Super Mario Kart. Super Mario RPG: Legend of the Seven Stars. Super Punch-Out! Super Nintendo Entertainment System SNES Classic mini NEW In Hand SHIPS FREE! SOLD OUT ALL OVER THE COUNTRY. DON'T MISS OUT ON THIS RETRO CLASSIC! 5 out of 5 stars - Super Nintendo Entertainment System SNES Classic mini NEW In Hand SHIPS FREE! 1,809 product ratings1,809 product ratings - Super Nintendo Entertainment System SNES Classic mini NEW In Hand SHIPS FREE! Super Nintendo Entertainment System (SNES) Mini Classic - In Hand, Ships Today! And if you didn’t have a Lisa Scampanelli, don’t sweat it. It’s a free world for you, my friend. Like you belonged, and the whole school accepted you into their arms for a big school hug. Just plug it in and play! Just plug it in and play. Live out the golden age of 16-bit gaming like never before. Just plug it in and play. Product Details. Super Nintendo Entertainment System SNES Classic Mini NEW In Hand Fast Ship! New and ready to ship! Smoke free and pet free home. 5 out of 5 stars - Super Nintendo Entertainment System SNES Classic Mini NEW In Hand Fast Ship! 1,809 product ratings1,809 product ratings - Super Nintendo Entertainment System SNES Classic Mini NEW In Hand Fast Ship! BRAND NEW Super Nintendo Entertainment System SNES Classic 2017 Mini FREE Ship! 5 out of 5 stars - BRAND NEW Super Nintendo Entertainment System SNES Classic 2017 Mini FREE Ship! 1,809 product ratings1,809 product ratings - BRAND NEW Super Nintendo Entertainment System SNES Classic 2017 Mini FREE Ship! USA version. -sold out everywhere. It's a rare console in limited quantities. Just plug it in and play. - Kirby Super Star. - Super Mario World. - Super Castlevania IV. - Super Ghouls ’n Ghosts. - Super Mario Kart. - Super Mario RPG: Legend of the Seven Stars. - Super Punch-Out! Brand new in hand! Will ship usps priority mail. Just plug it in and play. Live out the golden age of 16-bit gaming like never before. Snes classic for sale! $170 each. Currently have two left! Brand new SNES classic. Receipt included. SNES classic. New in box. Lady was passive aggressive towards the lady in front of her for being in front of her. No love for Alaska or Hawaii but no love for cancer either. He had a feather tattoo on his calf. You are Bidding on a Super Nintendo Entertainment System SNES Classic 2017 Mini NEW *UNOPENED* Brand New!!! Good Luck and Happy Bidding!!! The Super NES Classic Edition system looks and feels just like the original ’90s home console, except it’s super small. Play 20 classic Super NES games plus *gasp* the never-before-released Star Fox™ 2 game! Miniature Super Nintendo Entertainment System replica with 21 pre-loaded Super NES games Two wired Super NES Classic Controllers One HDMI cable One USB cable with AC adapter Will ship same day as purchased! 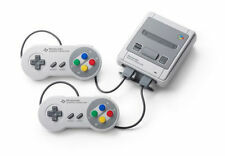 Console Nintendo Super Nintendo Classic Mini. (It works in every country cause its region free.). Kirby Super Star. Super Mario World. Super Castlevania 4. Super Ghouls 'n Ghosts. Super Mario Kart. Super Mario RPG: Legend of the Seven Stars. 1 USB cable with AC adapter. (, The Legend of Zelda: A Link to the Past, Yoshi's Island, Star Fox 2 ). For sale Brand New In Box SNES Classic Mini Super Nintendo Entertainment System Sold out everywhere! Get yours today! 100% Authentic! Feel free to message me if you have any questions! All sales are final thank you for looking! The era of the 16-bit console is often looked back on with genuine affection because of the fact that the SNES had such a rich library of titles that spanned a multitude of genres. 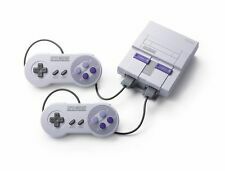 As a result, Nintendo has brought back some of that era of gaming by releasing the SNES Mini, which is a small system that allows you to play 20 of some of the most famous games from that console generation. This console, which is in high demand, is available on eBay, and you can even find them for some very affordable prices. How does this mini console connect to HD televisions? The original SNES used an RCA connector, which is no longer available on some HDTVs. Instead, Nintendo has designed this homage console to connect to your television via an HDMI cable. As a result, the games that are available on this console have higher resolutions than they did in the 1990s. In addition to this, the system is powered using a USB cable AC adapter, which means that you can plug the console directly into the television or even your other consoles when you want to power it. What are some titles that come preloaded on the console? "Super Street Fighter II: Turbo Hyper Fighting"
The previously unreleased "Starfox 2"
How many controllers come with the system? For those that like to engage in multiplayer, this system comes with two controllers. As a result, you can play two-player cooperative games like "The Secret of Mana," or participate in some brawling matches in "Street Fighter II." The controllers faithfully emulate the original SNES controllers, but these new pads have features like rewind that lets you rewind the action and resume from a previous suspend point. Additional controllers are available for those who wish to connect with several players at a time. The SNES Mini has a compact sizing of 5.25 x 4.25 x 1.5 inches, which means that it's significantly smaller than the original Super Nintendo. As a result, you can fit this console just about anywhere, even nestled between your current-generation consoles. See the manufacturer site for details.